One of the areas of my school library that needs updating is the occupation section. In the past few years I have weeded many out-dated books about police officers, doctors and even librarians. Bearport Publishing has released a new series of nonfiction titles about first responders that will fit a niche in many library collections. Doctors to the Rescue provides readers with a glimpse into the world of emergency room doctors and first responders. The first chapter follows a patient from the emergency room to the operating table as he undergoes heart surgery. Physicians are also shown at work treating earthquake victims in Haiti and at work on the battlefields in Iraq and Afghanistan. Up-close photographs show the demanding work of first responders. Many children will be interested to learn how doctors help patients during natural disasters, emergencies and war. However, the book is not for the faint of heart. In one photograph, a group of medical students work on a cadaver. Another photograph shows a Buffalo Sabres goalie grasping his wounded neck as he sits over a pool of blood on the ice. Between chapters Goldish includes information about the training required to become a physician. Back matter includes photographs of medical tools, a glossary of terms, and a suggested reading list. Readers interested in a career in medicine will enjoy learning about the many ways doctors respond to emergencies and disasters. 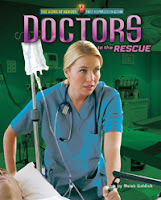 Other titles in the series include Paramedics to the Rescue, Firefighters to the Rescue, and Police Officers to the Rescue. This is an interesting book for the reason that I am interested to know how they feel and think during emergency times. Did the author include some malpractice done by some paramedics?